National police take cover as gunshots ring out at the end of a ceremony marking the 212th anniversary of the assassination of independence hero Gen. Jean-Jacques Dessalines in Port-au-Prince, Haiti, Oct. 17, 2018. Thousands of people protested across Haiti on Wednesday in sweeping anti-corruption demonstrations that coincided with a national holiday honoring one of the heroes of the country's independence, Jean-Jacques Dessalines. 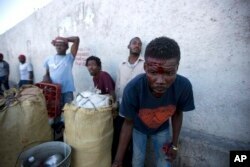 Police opened fire on demonstrators, injuring several, as the protesters threw rocks and set fire to tires, according to VOA Creole stringers in Port-au-Prince. Protesters are demanding transparency from the government regarding the alleged misuse of $3.8 billion in oil profits. 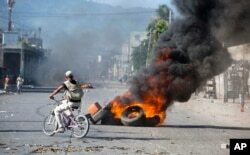 A man rides a bicycle past tires set afire by protesters demanding to know how Petrocaribe funds have been used by the current and past administrations, in Port-au-Prince, Haiti, Oct. 17, 2018. The money, made by Haiti under the Petrocaribe oil alliance signed between Venezuela and Caribbean nations in June 2005, had been earmarked for infrastructure and social and economic projects. Several audits have been done, with the results either failing to provide clear answers as to where the Petrocaribe funds went or showing that much of the revenue has been mismanaged, including being spent on construction projects that were not completed. An injured man looks for help after gun shots rang out at the end of a ceremony marking the 212th anniversary of the assassination of independence hero Gen. Jean-Jacques Dessalines in Port-au-Prince, Haiti, Oct. 17, 2018. In November 2017, a special Haiti Senate commission also accused more than a dozen government officials in former President Michel Martelly's administration of embezzling funds. The results have angered citizens and sparked a series of nationwide protests. Demonstrators demanded to know what happened to the oil revenue and called for the resignation of President Jovenel Moise. "[October 17] is a day of deliverance for us. It's a day to uproot poverty. It's a day to uproot unemployment. So we're asking everyone to hit the streets, because we can't go on living with these problems," a protester told VOA Creole. Salnave Elyse, who heads RAMNE (Rasanblement Militan Nodes, a northeastern militant group), denounced the opposition's plan to protest Wednesday. "This movement isn't really intended to help the people," Elyse said. "This is a way for them to pursue their own goals. The real objective behind this Petrocaribe movement is to overthrow the government and replace it with their own cronies." He called on the police and law enforcement officials not to let that happen. Haiti's President Jovenel Moise, center, and first lady Martine Moise walk with Prime Minister Jean Henry Ceant as they leave a ceremony marking the 212th anniversary of the assassination of independence hero Gen. Jean-Jacques Dessalines, in Port-au-Prince, Haiti, Oct. 17, 2018. 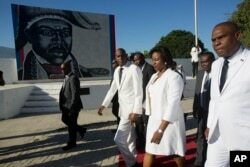 Earlier Wednesday, Moise, first lady Martine Moise and Prime Minister Jean Henry Ceant attended a ceremony marking the 212th anniversary of the assassination of Dessalines. A policeman was hurt at a wreath-laying ceremony when a protester threw a rock at him. Meanwhile, in the suburb of Petionville, police fired warning shots and tear gas when protesters flooded the road leading to Moise's private residence. Large protests were also reported in Les Cayes, Jacmel, Jeremie, Mireballais, Gonaives, Petit Goave and Cape Haitian, where protesters chanted "Catch them! Lock them up!" VOA Creole stringers Exalus Mergenat, Makenson Charles, Roney Innocente, Jean Hernst Eliscar, Clement Collegue and Wilner Cherubin contributed to this report.